AFC Fylde manager Dave Challinor, whose promotion-chasers travel to Brackley Town in Vanarama National League North tomorrow, is surprised that this weekend’s opponents are struggling. In direct contrast to Fylde, Brackley are precariously close to the relegation places, fourth-bottom just two points away from the drop-zone and scrapping for their lives. Challinor said: “We played them earlier in the season (a 2-2 draw at Kellamergh Park) and I didn’t think they would be down there. “Brackley have players with plenty of experience at this level and even higher, but they have drawn too many matches. While the Coasters were busy keeping their promotion push going on Monday, Brackley had an unwanted day-off on the bank holiday – the Saints’ match with AFC Telford was postponed because of waterlogging. AFC Fylde go into tomorrow’s clash in a rich vein of form. They are in third spot in the table, level on points with second-placed North Ferriby United but 12 adrift of pace-setters Solihull Moors, who have played two more matches. The Coasters were in outstanding form on Easter Monday with a 4-0 win at Stockport County, stretching their unbeaten run to six games, four of them won. 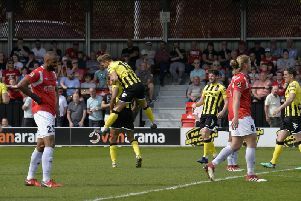 In the process they have earned praise for the manner of their performances, not least from people connected with Challinor’s former club Stockport, who agreed that it was one of the best displays of the season from the Coasters. He said: “It would have to be right up there and it was nice to get recognition for how we played on social media and in people’s comments at the match. “It was a 90-minute performance and we were on the front foot from the beginning to the end. “We killed the game off and managed to keep them out of the way of (goalkeeper) Ben Hinchliffe. Richie Baker has completed his suspension and is available for selection for the Brackley fixture. Fellow midfielder Bohan Dixon is suspended for the Brackley trip. AFC Fylde are set to play their home fixture against Bradford Park Avenue on Monday, April 11. The fixture was abandoned just after the half-hour mark on Easter Saturday, when the pitch became waterlogged after a heavy downpour.